The summers in Fayetteville, North Carolina are hot with lots of humidity. This can cause spontaneous thunderstorms and rain showers. In order to be ready for such weather, your commercial building’s foundation must be ready for any weather that appears. Your foundation is the backbone of your business, and so you should assure it is taken care of. Foundation failure is not something you want to deal with if you have regular storms. Water can leak into your business and cause mold and mildew to grow. In the end, having a strong foundation is the basis of having a strong commercial building. In order to have such a dependable foundation make sure to call Atlas Piers. With a team of foundation repair professionals, Atlas Piers is the first you should call if you notice foundation failure. We are your foundation repair Fayetteville North Carolina experts! When you notice these signs in your Fayetteville, North Carolina business, don’t hesitate to give us a call us at Atlas Piers. There is no reason to wait on foundation repairs. Your commercial building is a big investment and should be taken care of. We can help you keep it’s foundation in great shape. This will keep the value from decreasing, and will keep your employees safe. When thinking about making the foundation repairs in Fayetteville, NC, Atlas Piers has the experience and qualified team to make the decisions about the underpinning that will strengthen, stabilize, and lift your foundation. When we choose products we use Earth Contact Products (ECP). They are known for having the best products on the market. We use their helical piers and steel push piers to add the strength that is needed to lift your foundation and keep it from settling and sinking further. These piers are driven into the ground beneath the foundation, deep into stable soils. Then, the weight of the structure is transferred onto them and the foundation is raised to its original level. Other types of piers we use are slab piers, new construction piers, and micropiles. If we have found any void areas below a slab on your property, we can do pressure grouting. We inject grout under the slab to stabilize it and get back its ability to hold the load that was intended. The grout mixes with the soil and adds that strength.We also specialize in helical tieback installation and carbon fiber repairs. 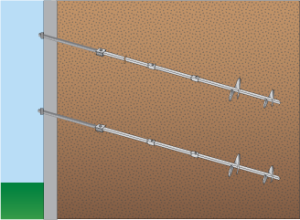 Helical tiebacks are used to straighten leaning or bowing basement walls. They anchor into the ground adjacent to the foundation wall and apply opposite pressure to straighten it. Carbon fiber strips are also used to repair foundation walls. These strips provide strength and support to lock the walls into place and seal cracks. Another repair service that Atlas Piers offers is wall encapsulation. This involves the installation of a vapor barrier around basement or crawlspace walls. The vapor barrier seals out moisture to prevent mold from growing and keep the area dry. Not only will your basement stay dry, but the air in the entire building will be cleaner, keeping both you and your customers healthier. Atlas Piers wants your commercial foundation repair in Fayetteville to be done correctly and give you a commercial building that keeps its value. So no matter what solution is needed, we can provide it. It could be helical piers or other underpinning solutions, or even carbon fiber strips. No matter what you might need, we have you covered. Call Atlas Piers of Atlanta, your foundation repair Fayetteville North Carolina team.